Synopsis: The group NWA emerges from the streets of Compton, California in the mid-1980s and revolutionizes Hip Hop culture with their music and tales about life in the hood. In the mid-eighties, while the hip-hop music scene was being dominated by East Coast artists like Run-DMC and Public Enemy, a storm was brewing on the West Coast. A group of young men in Los Angeles calling themselves N.W.A. (short for “Niggaz Wit Attitudes”), were preparing to take over the rap world with their hard-hitting lyrics and slick beats. Named after the group’s debut 1988 full length album, Straight Outta Compton tells their story. Straight Outta Compton follows N.W.A. from its inception to its completion. It begins with the formation of the group, showing Ice Cube (O’Shea Jackson Jr., who is the real Ice Cube’s son), Dr. Dre (Non-Stop‘s Corey Hawkins), and DJ Yella (Neil Brown Jr. from “Suits”) as they collaborate, mixing Cube’s ghetto poetry with Dre’s musical production. They convince Eazy-E (Contraband‘s Jason Mitchell) to invest money from his drug dealings into the group, and he brings along his rapper buddy MC Ren (Aldis Hodge from A Good Day to Die Hard) to round the group out. Success seems to come easy for the guys, as their first single, “Boyz-n-the-Hood” becomes a local hit and they are able to hook up with a manager named Jerry Heller (Paul Giamatti, who played a similar role in Love & Mercy). The debut album, Straight Outta Compton, makes them famous, but also notorious, as songs with titles like “F**k tha Police” and “Dopeman” cause controversy throughout white middle-class America. As Eazy-E emerges as the frontman and star of the group, tensions rise among the other guys who feel that they do more of the creative and musical work. The guys struggle to keep the group together and still remain friends and brothers amidst all the turmoil of their success. With a group of producers that includes Dr. Dre, Ice Cube, and Tomica Woods-Wright (Eazy-E’s widow), plus frequent set visits from MC Ren and DJ Yella, there were enough people who were really there to ensure that director F. Gary Gray (The Italian Job, Friday) told an accurate story in Straight Outta Compton. Or, at least that he told a story that will bring people to the theaters and make some money. And that he has done. The film does seem to tone things down a bit in places, whitewashing the violence, downplaying the drug use, and sensationalizing the racism that N.W.A. had to deal with, but that only serves to make sure that the film is about the music and the friendships, and not about the gangsta lifestyle. One thing is for sure – fictionalized or not, Straight Outta Compton is never tedious or boring, despite its almost two-and-a-half-hour running time. Between the powerhouse music and the intriguing storylines, the film is always engaging and entertaining. There are scenes of genuine and honest humor sprinkled throughout (Eazy-E’s first attempt at rapping is hilarious), and Gray even manages to throw in a couple of good The Italian Job-like car chases. Straight Outta Compton has got it all. Towards the end of the movie, there’s a scene in which Ice Cube and Eazy-E discuss Cube’s 1991 movie Boyz n the Hood, referring to it as an “Afterschool Special.” That’s a bit what Straight Outta Compton feels like, too, and as Eazy says in the scene, “I like Afterschool Specials.” So does everyone else, and that’s why Straight Outta Compton is going to appeal to more than just N.W.A. fans. Overall, the acting in Straight Outta Compton is good, but there are a few mixed bag performances. Most of the cast, including the members of N.W.A., seem to have been cast as much for their physical resemblance to their real-life counterparts as for their acting abilities, and that’s fine; if Snoop Dogg, Suge Knight, or Tupac Shakur are going to make appearances in the film, they may as well be authentic-looking. As for the principals, they’re mostly good. O’Shea Jackson Jr. nails his performance, becoming an eerie doppelganger for his father. Likewise, Jason Mitchell is amazing as the slick talking, fast walking jheri curled Eazy-E. Corey Hawkins is a little less effective as Dr. Dre; he gets the attitude and charisma right, but there are a few key moments where he doesn’t quite deliver. For example, in a scene where Dre has just been told that his brother is dead, Hawkins is sitting on a curb while the other guys console him. From his voice and his facial expressions, he appears to be crying, but the lack of real emotion and tears is apparent. In contrast, when Eazy-E is given his bad medical news late in the film (no spoilers for those who may have been under a rock), Mitchell gives a brilliant performance, showing real turmoil and grief. In a film that is basically carried by the trio of O’Shea Jackson Jr., Jason Mitchell, and Corey Hawkins, well, two out of three good performances ain’t bad. 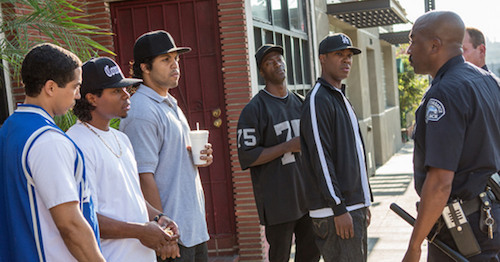 Of course, there can’t be a movie about N.W.A. without the music, and the music drives Straight Outta Compton. Ice Cube and Dr. Dre are producers of the film, so song rights were no problem, and the soundtrack includes all of the N.W.A. hits. The music is a mixture of original tracks and new productions of the songs, with the actors doing much of their own vocals. The actors were coached up by frequent Ice Cube collaborator William “Dub-C” Calhoun, so their natural talents were enhanced by expert advisement. Incidentally, Corey Hawkins and Neil Brown Jr. were similarly coached on DJing by Robert “DJ Robshot” Johnson in order to add authenticity to that aspect of their performance. Between the original tracks and the new production by The Underdogs (the musical team behind the soundtrack to Pitch Perfect), not to mention the cinematic score by Joseph Trapanese (Insurgent, Earth to Echo), the music to Straight Outta Compton captures and releases the energy and electricity of the West Coast hip hop scene in its heyday.